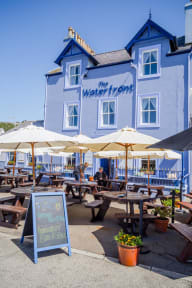 The Waterfront Hotel has 16 high quality en-suite bedrooms, many with sea view which provide the perfect venue to experience all local fresh food and hospitality in this beautiful coastal corner of Dumfries and Galloway, South West Scotland. The hotel has a Bar, Restaurant and a wide terrace, which can be extremely popular throughout the day, whether you choose to have breakfast, a morning coffee, a light lunch or an evening meal with us. This perfect location to overlook the harbour and to enjoy the magnificent views and relax. Porpatrick itself is a beautiful, picturesque, village that sits on the harbour side. It has a range of restaurants, cafes and shops. 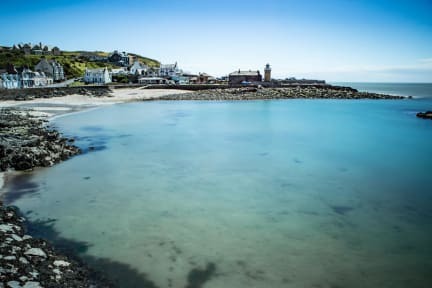 There is a lovely small beach and promenade and is a great base for many walks along the spectacular coastline . Cancellation policy: 3 days. before arrival at 6pm.